People usually turn their noses up when you mention brussel sprouts, but this happens to be one of the girls’ favorite vegetables. They even take the left overs for their lunch. They say they get a lot of “What is that?” and “Eewe! !”, but they don’t care, they just bring what they want to eat. I love that about them, and I hope they don’t ever change. They always impress the teachers though. They can’t believe they eat the vegetables that they do. Their other favorite thing to bring for lunch? Artichoke! But that will be another post. 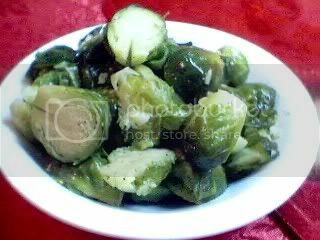 1 pound FRESH brussel sprouts – contrary to the frozen foods manufacturers, brussel sprouts do not freeze well that is why so many people hate them. Boil about 4 cups of water in a pot. In the meantime, trim the outer leaves from the brussel sprouts and cut them in half. Wash thoroughly and add to the boiling water and boil for 7 minutes. I usually put the timer on for this because when you over cook them, that’s when they develop that foul odor. Plus, the girls just don’t like the texture of overcooked vegetables. After the brussel sprouts have cooked for seven minutes, drain them in a collander and return the pot to the heat. Add the olive oil after residual moisture in the pot has evaporated. Sautee the garlic in the olive oil until fragrant, and return the drained brussel sprouts to the pot. Stir well to blend the flavors, and season with salt and pepper. Done! ‘will have to think of something else to make this attractive to my kidlets. I did with asparagus but with brussel sprouts, good luck to me! uray siak paboritok met dagitoy kastoy a nakilnat wenno ensalada, kas koma daytay ensalada a repolio, nagimas nga ideppel iti bugguong a nagalipan iti kamatis! wenno galipan iti kamatis ken naganus a lasona sa ikkan iti bugguong-aramang! kayatko pay ‘tay nakilnat wenno steamed a broccoli! Hi Drstel, yeah, you and my girls will get along, alright. You should try this method, I found it gave the best flavor, not too bitter, and the smell is non existent. Our nephew who doesn’t really like brussel sprouts but was too polite to say anything when he had dinner at our place, was pleasantly surprised to find out that these were enjoyable. Wow JMom, your girls are adventurous. I know very few people who enjoy B.sprouts. I was cooking them as a side for my Thanksgiving dinners but noticed no one really ate them except for me so I had to pull it off my menu. This year, I’m going to make a small portion. Just for me. Will try this. Kachokaran ko yata mga girls mo?, I also love artichokes. Next summer I’ll try planting the B. sprouts. Thanks! Nice photo.